House Majority Leader Eric Cantor, R-Va., was stunned Tuesday, after being booted from his seat in the Republican primary by David Brat, an upstart tea party-backed economics professor. Brat defeated Cantor in the 7th congressional district, 56-44 percent, shocking the political establishment. While many felt Cantor would be pushed by Brat, few predicted Cantor would ultimately be toppled. "Yikes. I didn't see that coming," one top Republican told CBS News Congressional Correspondent Nancy Cordes. It was an upset no one saw coming. Cantor's own internal polls reportedly had him up by more than 30 points. 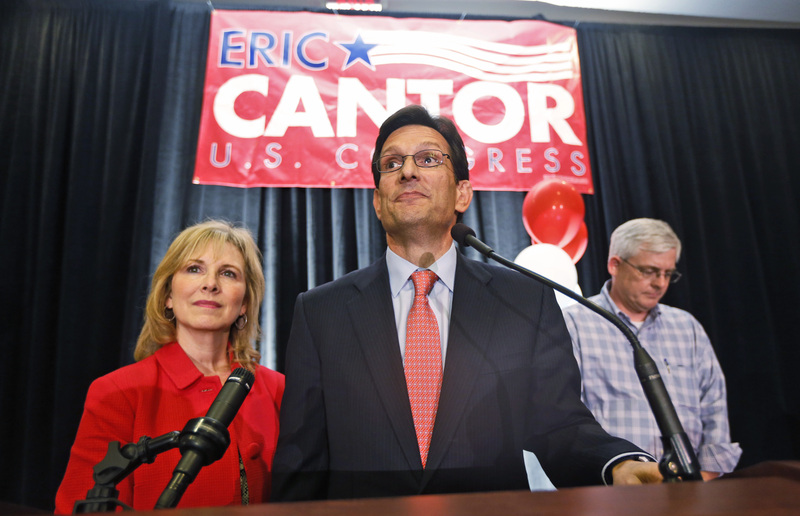 What does Cantor defeat mean for Republican Party? "This is a miracle from God that just happened," Brat said as the results were tallied, according to the Associated Press. As the votes were counted, Brat jumped out to an early lead from areas usually more Republican and conservative, so many felt the Richmond suburbs of Henrico County could help Cantor catch up. But it was not to be and Cantor lost throughout the sprawling district as all the votes and absentees were tallied. "Obviously we came up short," Cantor told supporters in his brief concession speech. Cantor, first elected to the House in 2000 and currently the second most powerful member of the House, becomes the first House majority leader to lose his re-election bid in a primary in over 100 years. Brat had attacked Cantor on immigration reform and Cantor felt the need to distance himself from reform efforts including noting that he did not support amnesty. The aftermath of this race will likely mean that Republican House members, who have long feared a primary challenge over the issue of immigration, will now completely back away from the idea of immigration reform. Cordes points out, "the reality is, immigration reform was basically dead this year already. House Speaker John Boehner dropped it when it became clear that many House Republicans opposed comprehensive reform, especially in an election year." In a year where the tea party's demise has been repeatedly suggested, Tuesday's victory has rejuvenated that wing of the Republican Party. After a string of high-profile defeats - including tea partier Matt Bevin's loss to Senate Minority Leader Mitch McConnell, R-Ky., last month - the tea party has seen two upsets in as many weeks. Brat's downing of Cantor comes on the heels of upstart Chris McDaniel's upset of Sen. Thad Cochran, R-Miss., last week, forcing that primary into a June 24 runoff. Brat, an economics professor at Randolph-Macon College and a political novice, was outspent 40-to-1 by Cantor and Cantor had outraised Brat, $5.45 million to $207,000, according to the Center for Responsive Politics. Outside money poured in to boost Cantor, to no avail. Groups such as the National Rifle Association, the American College of Radiology, and the National Association of Realtors also spent money on ads to promote Cantor. The district encompasses the wealthier suburbs around Richmond including densely-populated Henrico County, which should have been Cantor's base of support. However, he lost all parts of the district, including Henrico. Although the margin was narrow, district-wide, the geographic distribution of the vote shows a consistent win for Brat across the district. Brat moves on to face another Randolph-Macon College professor, Democrat Jack Trammell, in November's general election. Cantor's fellow House Republicans were slow to respond to his defeat. His Democratic colleagues, on the other hand, wasted no time in piling on. "The American people should take notice. Tonight, the Tea Party defeated Republican Leader Eric Cantor who is one of the most extreme Members of Congress," House Minority Leader Nancy Pelosi, D-Calif., said in a statement. "Eric Cantor has long been the face of House Republicans' extreme policies, debilitating dysfunction and manufactured crises. Tonight, is a major victory for the Tea Party as they yet again pull the Republican Party further to the radical right," she added. House Speaker John Boehner, R-Ohio, who has had a roller coaster working relationship with Cantor - including Cantor's repeated eyeing of Boehner's speaker gig - weighed in at 11:20 p.m. ET with a brief printed statement. "Eric Cantor and I have been through a lot together," Boehner said. "He's a good friend and a great leader, and someone I've come to rely upon on a daily basis as we make the tough choices that come with governing. My thoughts are with him and Diana and their kids tonight."